Apple, it’s not funny anymore. Apple iCloud is a fantastic service. For me, it works far better than Google services, especially when it comes to cloud backups. I use it daily when working with my iPhone, iPad, Mac and MacBook at home. In the office, I still have to use the good old Windows PC, and I hate it. I use iCloud backups to keep my data safe (secured with two-factor authentication), and it really helped me on at least two occasions when I had my iPhone lost or broken far away from home. I use iCloud Photo Library to get my photos synced across devices. I actively use iCloud Drive when working with documents. I use iCloud syncing, including the keychain, to store my passwords and credit card data and have them all handy. I should say that I cannot work effectively without iCloud. But we have a lot of security and privacy concerns. We completely understand that it is not possible to pick all three from the “security, privacy, usability” trio, but please give at al least two. Here is a story from August 2016. 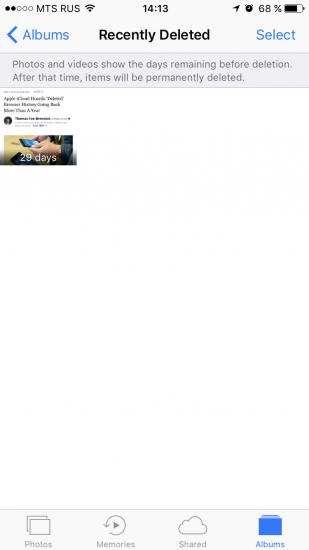 When you delete the media file from iCloud Photo Library, it goes to the “Recently deleted” album first, and stays there for 30 days — unless you remove it from there manually. This is a good implementation (if it works), like the “Trash” in macOS or “Recycle Bin” in Windows. But we discovered that “deleted” files are not actually deleted, and we were able to extract them from the iCloud – even those photos that were deleted two years ago. Apple declined to comment, but in the next few days, older pictures and videos were silently removed. Three months later, in November 2016, we made another discovery. There is an option to sync contacts, notes, calendars and some other data categories with the iCloud. We discovered that call logs (including information about all incoming and outgoing calls, as well as some calls made with VoIP software) are silently uploaded to iCloud. We informed the media about that in advance, and they asked Apple for comments. I had 10 minutes on the phone with two Apple engineers the day before releasing our software to extract call logs, I explained them all the details, and even provided with our materials, including some technical stuff. The next day, when the news became public, Apple issued an official statement that this is a part of ‘Continuity’ feature, though we know (and they know) that it is not, and we provided (again, in advance) a detailed explanation why. We even had to post a follow-up on that. Three more months (February’2017), and yet another one. Syncing browsing history is a neat feature. Quite often I work on my iPhone or iPad, and instead of placing bookmarks (or adding links to the reading list) to the web pages of interest, I just open Safari history on my laptop, and all recent links are there. Once a link is deleted on one device, iCloud sends a push notification to all other devices to delete the particular record from there, too. Same if you clean the browser history completely. However, we found that all the records are still kept in iCloud and can be extracted from there, albeit not easily. Apple has not commented on that, but they simply purged ALL history records older than two weeks from iCloud, for all users. Let me stress that: Apple deleted ALL history records older than two weeks, and not just the records that were cleared from the device. Apple have to explain, if this was an intentional behaviour or a bug. That they had silently “repaired” it over night, i guess it was either intentional or a development setting (to do a roll back if it doesn’t work) that was forgotten. We all know, that Apple isn’t perfect. And that’s okay. But they should handle their mistakes in a more transparent way. It mentions bookmarks but not browsing history; no information on storing call logs is provided; and it is said that deleted content is cleared. Oh, really? 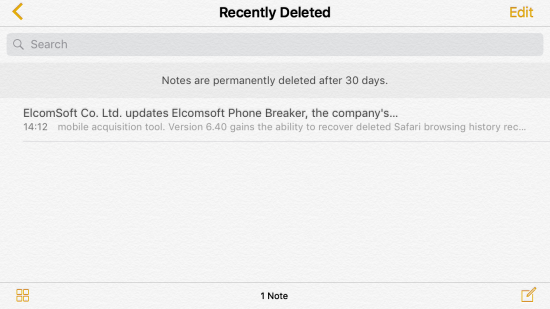 Notes are permanently deleted after 30 days. Again, this is not funny, Apple. I cannot believe that it’s just a bug. It already happened three times, and you should have learned. Looking forward to see an official statement on that. Please do not tell us that you keep deleted record just in case for syncing an occasional offline device, and you’ve been waiting till it goes back online: you have a list of all devices connected to the account, you have connection logs, and you keep deleted notes even if there is just one device on the account. I do not see any good reason to keep deleted data for even a single day – or even if such reason exists, please make a clear note on that (like at least “well, we are going to delete your data permanently, but cannot say how long it is going to take”, which is not perfect but at least something). Oh well. It seems that Apple security engineers are too busy implementing additional “security checks” that force the iCloud accounts to be locked (fortunately, just temporary) once you download device backups from them. Yeah, “suspicious activity”, even if you download your own backups, or if you are the law-enforcement officer monitoring the suspect’s activities. Do you really worry about cloud security and want to prevent the next celebgate? We thought that 2FA is good enough, or if it is not, please let us know (may be we mу missed something). 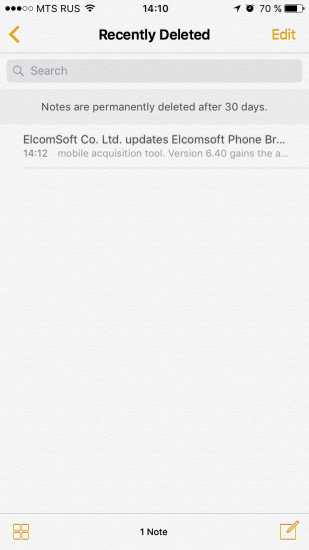 This entry was posted on Friday, May 19th, 2017 at 11:21 am	and is filed under Did you know that...?, Elcom-News. You can follow any responses to this entry through the RSS 2.0 feed. Both comments and pings are currently closed.